Find out information on history and origin of Kumbh Mela. 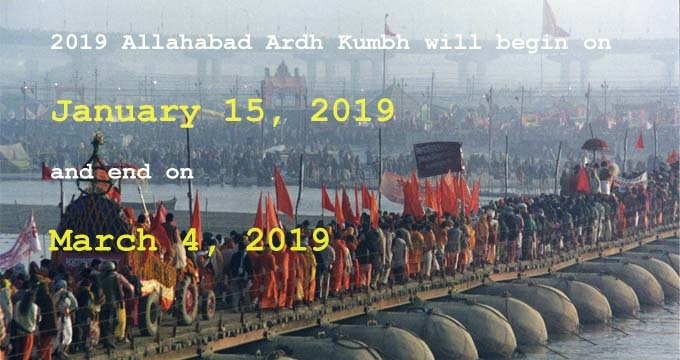 Kumbh derives its name from the immortal Pot of Nectar, which the Demigods (Devtas) and Demons (Asuras) fought over, described in ancient Vedic scriptures known as the Puranas. It is these Vedic literatures that have stood the test of time, out of which the tradition has evolved into the one that the world now knows as The Kumbh Mela. Legend tells a tale from the bygone days of the universe when the demigods and the demons conjointly produced the nectar of immortality. The demigods, because cursed, were crippled of fear that eventually made them weak. The task being too sturdy for them alone, the demigods made a mutual agreement with the demons to complete it in full and share the nectar of immortality in half. It is said that the demigods and the demons assembled on the shore of the milk ocean that lies in the celestial region of the cosmos. And it began! For the task of churning the milk ocean, the Mandara Mountain was used as the churning rod, and Vasuki, the king of serpents, became the rope for churning. With the demigods at Vasuki’s tail and the demons at his head, the churning began. At first, the churning of the milk ocean produced a deadly poison which Lord Shiva drank without being affected. As Lord Shiva drank the poison, a few drops fell from his hands which were licked by scorpions, snakes, and similar other deadly creatures. Also, during the churning, the Mandara Mountain began to sink deep into the ocean, seeing which Lord Vishnu incarnated as a great tortoise and supported the mountain on His back. Finally, many hurdles and 1000 years later, Dhanwantari appeared with the Kumbh of immortal nectar in his hands. The demigods, being fearful of the demons' ill intent, forcibly seized the pot with its safety entrusted onto the four Gods - Brahaspati, Surya, Shani, and Chandra. Demons, after learning that their part of the agreement has not been kept, went after the demigods and for 12 days and 12 nights, the chase continued. Wherever the demigods went with the pot of nectar, fierce fighting ensued. It is believed that during this chase, a few drops from the Kumbh fell at four places - Allahabad, Haridwar, Ujjain, and Nasik. There is also a prevalent legend that it was actually the demons that were being chased by the demigods for 12 days and 12 nights, during which the drops of elixir of immortality fell at these four places. These four places are since believed to have acquired mystical powers. Because 12 days of Gods are equivalent to 12 years for humans; the Kumbh Mela is celebrated once every 12 years in each of the four places - banks of river Godavari in Nasik, river Kshipra in Ujjain, river Ganges in Haridwar, and at the Sangam of Ganges, Yamuna, and Saraswati in Allahabad, where the drops are believed to have fallen. Millions of devout, come together to partake in ritualistic bathing and ceremonies to cleanse themselves of all sins.